Join us at our Annual Lunar New Year Market and Food Festival. We are bringing back the food competition for a second year in a row with lots more award-winning restaurants. Chinese New Year is the most important holiday for Chinese families as it is a time of reunion and thanksgiving. 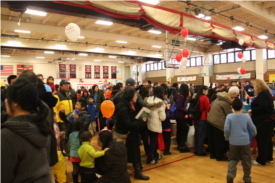 This festival is one of the most popular and largest celebrations of the Lunar New Year in Massachusetts. - “QARI’s Got Talent” Karaoke Competition! Finalists judged on main stage - cash prizes! - QARI Children’s Corner - featuring book signing and story time with acclaimed children’s Author and National Book Award Finalist, Grace Lin. - Year of the Dog Photo Booth! Each New Year is named for one of the twelve animals. According to ancient legend, the Lord Buddha once summoned all animals to come to him. When only twelve came, he rewarded them by challenging the animals to race and naming each year for them in the order they finished. Note: Numbers expected to surpass 4,000 with children and family activities. Free parking at N. Quincy T Station.